Since this is a semi-public diary, it's also a semi-private diary. To quote Tweedledee (or was it Tweedledum? ): that's logic! 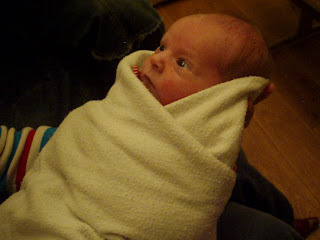 And in that spirit, dear readers, I present to you one of the first known photographs of my daughter, A. Zola Sterling, born Monday. 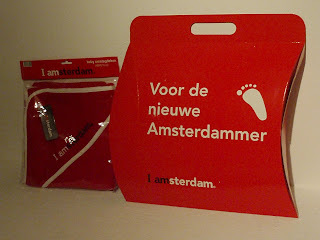 When I was registering her birth this afternoon, I received the following package from the city of Amsterdam; one can never begin too early with city marketing, apparently. After the more: a Dutch-only joke. De vrouw achter de balie gaf mij het pakketje aan en zei "voor de nieuwe inburger." CONGRATS!!! Makes me even more excited for our newest to arrive in June! We find out Wed. if boy or girl, I'm thinking girl this time though! What does the A. stand for? nevermind.. it finally showed up.. and no, I don't get it but my husband is reading it now, maybe he can explain it to dumb ole me! He doesn't get it either, how it's freudian in any way? Only mistakes he found was GAAF should be GAF and he's not even sure if inburger is a word so you have to spell it out for me. The A. stands for "Arden." Names we didn't use: Tessa, Nora. "Gaf" is a plain old mistake by me (I'll correct it) but "inburger" was the mistake I meant to point out _ glass houses, right? The woman was talking to a foreigner (namely me), so she called my child an "inburger". Maybe a little too obscure, but it struck me funny given my whole fight with the IND. To give a flavor, in English maybe it would be like saying "congratulations on your new rabies." The opening picture is not correcr anymore now!!! Make a new one. With a speed skating hat for Zola too.